This story was published online by the Orangeburg Times and Democrat newspaper on April 9, 2017. It is republished here with permission. St. Matthews resident Nalanda Mack was honored as Employee of the Year. Mack works as an inventory control clerk at the Husqvarna distribution warehouse in Blythewood, South Carolina. Kitty Bamberg, a business development specialist at the S.C. Vocational Rehabilitation Department’s Orangeburg office, accepted the award in Mack’s absence. “She’s a great young woman. She’s overcome her disability and is working and sustaining herself,” said Bamberg, whose office is where disabled people are taught job-readiness skills. Bamberg also accepted the award on behalf of Hi Cotton Greenhouses of St. Matthews, which is a wholesale distributor of flowers and potted plants. The business has just hired two deaf and hard-of-hearing clients from the S.C. Vocational Rehabilitation Department’s Orangeburg office. Jimmy Boland, director of adult day programs at the Orangeburg DDSN, accepted the award on behalf of Orangeburg County, which he said has been a valuable partner to his office in the employment of disabled people. “The county has a heart for our workers,” Boland said, noting the work sites in the county for those with disabilities has grown from three in 2010 to 20 locations which now employ 50. Donald Ricks and Brian Schlachter of Husqvarna accepted the company’s award as Large Employer of the Year. Schlachter said the disabled employees, whose duties include house and grounds keeping, provide a valuable service with a good work ethic and pleasant attitudes. “We’re always looking for the next partnership,” Schlachter said, noting he looks forward to receiving some of the “biggest smiles, hugs and handshakes” from the disabled employees. There are 46 employees with disabilities at Husqvarna, with Ralphie Haigler, Diamond Madden and Anthony Garner among them. Husqvarna was awarded the Large Employer of the Year Award at the ninth annual awards breakfast of the Greater Orangeburg Area Mayors’ Committee on Employment for People with Disabilities on March 22. Husqvarna employs 46 disabled individuals, representing what OCDSNB officials have described as a “win-win partnership.” From left are Donald Ricks of Husqvarna, OCDSNB contract procurement specialist Arlette Thomas, Brian Schlachter and Phillip Myers of Husqvarna, and OCDSNB Executive Director David Goldmintz. Haigler works on an assembly line in the day and returns to the plant at night to perform janitorial work. “You have to have responsibility to do your task and a girl has got to pay bills. You don’t have to depend on nobody but yourself. You gotta stand on your own two feet,” she said. Peele is an 18-year-old set to graduate from North Middle/High this year. He has also proven to be a skilled contributor at The Technology Center in Orangeburg, where instructor Barbara Joye said he is a joy to work with. She said Peele also works at the Program for All-Inclusive Care for the Elderly (PACE) center in Orangeburg, a program of The Oaks. “He’s an awesome guy. ‘No’ is not in his vocabulary,” Joye said, noting Peele operates a greenhouse, works in the coffee shop and has become adept at operating lawn maintenance equipment at The Technology Center. “He’s learning the value of being a great worker. We are all so proud of him and his accomplishments,” Joye said. 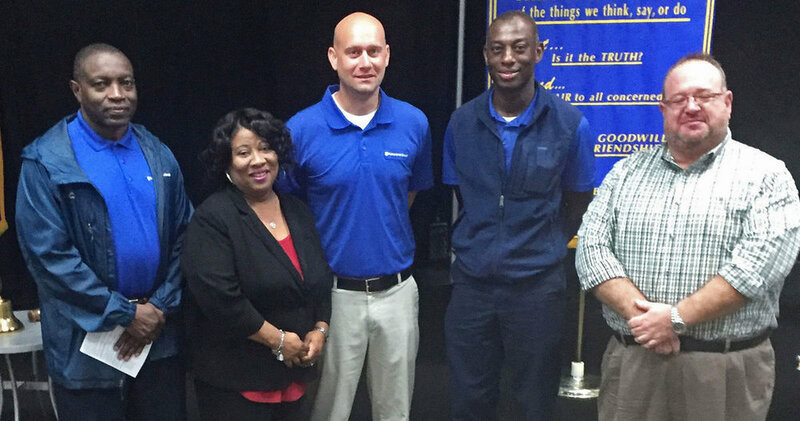 Orangeburg Mayor Michael Butler, school-to-work coordinator at The Technology Center, said helping individuals transition into gainful employment was a passion of his. The mayor said the city remained a faithful supporter of the Orangeburg DDSN and its mission and goals. Peele was joined at the event by his father, a maintenance supervisor with Site-Prep Inc. in Orangeburg. Peele said the award makes him feel good, noting that he likes “everything” about The Technology Center. “I learn to do good work, and I plan to go to work with my dad” upon graduation, he said. Dr. Eddie Glenn Bryant and Dr. Shirley Madison serve as co-chairpersons of the committee and praised area employers for helping make their mission possible. Also during the ceremony, Bryant gave special recognition to Ron Lofts, who retired as executive director of the OCDSNB in October after serving for 11 years. David Goldmintz is the current executive director.